The official motion picture soundtrack for The Da Vinci Code with Thomas Bowes (violinist), King's Consort Choir, Hugh Marsh, Orchestra, Richard Harvey, Hila Plitmann, Martin Tillman was released on May 9, 2006 via Decca label. The film's music was composed by Hans Zimmer, whose work resulted in a nomination for the 2007 Golden Globe Award for Best Original Score. For a soundscape that was religious to the core, Zimmer used a massive orchestra and chorus to create a dramatic 'stained glass cathedral' feeling. While the score has more in common with Zimmer's previous work for Hannibal, there is also a solid mixture of the motifs used for The Thin Red Line and Batman Begins. The thirteenth cue, "Chevaliers de Sangreal", is the most bombastic; powerfully underscoring the 'discovery' scene in the film. Like Media Ventures protégé Harry Gregson-Williams, who composed the soundtrack for The Lion, the Witch and the Wardrobe, Zimmer used Abbey Road Studios to help create his music for The Da Vinci Code. Additional sections were recorded at London's AIR Studios, atop Rosslyn Hill. Director Ron Howard commented that "Like every other facet of this movie, the score for The Da Vinci Code demanded a range of textures that recognized and reinforced the layers of ideas and emotion, which unfold as the basic story does." Claiming that Zimmer was "inspired", Howard added that "Hans Zimmer has given us extraordinarily memorable music to appreciate within the framework of a film or completely on its own, where you can let the sounds carry you on your own private journey." Dies Mercurii I Martius 6:03 This piece is played at the final confrontation with Sir Leigh Teabing, including Robert Langdon seeing all history before his eyes and him throwing the cryptex in the air. L'Esprit dès Gabriel 2:48 This piece is entirely played during the moment when Robert Langdon explained to Sophie Neveu at Bois de Bologne about the Priory of Sion, the Knights Templar & their involvement in history. Fructus Gravis 2:50 This piece is played mainly during the acquisition of the cryptex at the Depository Bank of Zurich. It is also played at the end of the film. Malleus Maleficarum 2:19 Named after the infamous book during the Inquisition, this piece is played when Sir Leigh Teabing explained to Sophie Neveu about how the women in the medieval were hunted by the church. Daniel's 9th Cipher 9:31 This piece is played at the Rosslyn Chapel, when the duo begin to decipher the last puzzle; the location of the Grail. Rose of Arimathea 8:11 The first half of it is played during the time when Silas remembering his dark memories at the doors of Eglise Saint-Sulpice, while the second half is played when Sophie remembering her memories with her grandparent, Jacques Saunière. Beneath Alrischa 4:23 This piece is played during each time when the characters are endangered, hunted or being chased. ℗ © 2006 Universal Music Classics Group, a Division of UMG Recordings. Inc. 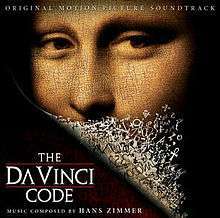 The Da Vinci Code's director, Ron Howard, said that the soundtrack was "powerful, fresh and wonderfully effective" and most film music reviewers agreed with him. Soundtrack.Net and Scorereviews rated the score highly. The music was nominated for a 2007 Golden Globe Award for Best Original Score but lost to Alexandre Desplat's work for The Painted Veil. ↑ "The Official Website of A-ha Celice 2005". ↑ "The Da Vinci Code (Original Motion Picture Soundtrack)". discogs.com. Retrieved 2014-01-23.